Access rooflights can add value to your property .. The Roofglaze Flatglass Skyway Access rooflights can be specified to allow direct, easy access to rooftop terraces. This easy to use, electrically-operated, contemporary Flatglass access rooflight is the ideal choice for homeowners, architects, builders and property developers as an access solution for rooftops with restricted space, creating a seamless indoor-outdoor transition between living spaces. 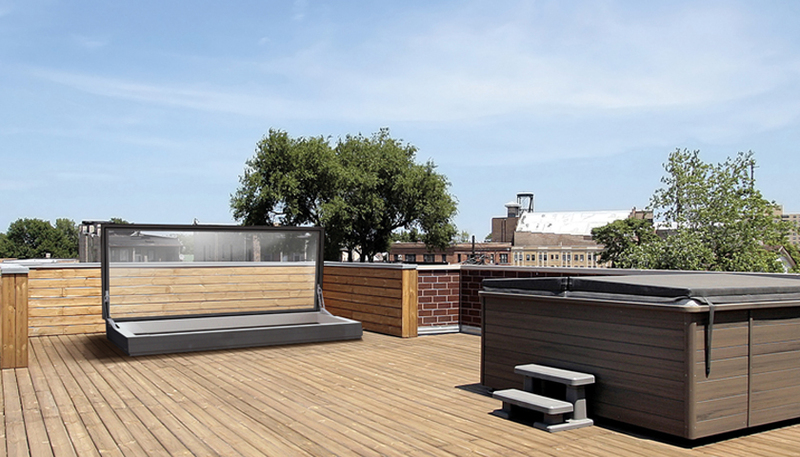 Building Regulations often require that the roof terrace design does not detract from the character and appearance of the property and neighbouring buildings. Flatglass Skyway Access rooflights can facilitate this, providing a modern, low-profile, minimalist design that integrates seamlessly with the building’s architecture. Safe and secure, the Skyway is mechanically sealed, for additional peace of mind. To find out more about access rooflights by Roofglaze, please click here.